It’s a slow day today and I decided to go refinish one of our older Souris River Quetico 18.5’s. It’s a canoe that I have refinished once before and is in otherwise nice shape other than the outside looking in need of a new shine plus I needed to sand off graphite and epoxy that ran when I did a sloppy skid plate repair 2 years ago to meet an overnight time constraint. So, just like every other refinishing job for a Souris River, it’s pretty straightforward. Sand the parts that are oxidized and all the parts that are shiny using 80 grit sand paper and a palm sander. I also removed a few clear epoxy runs from my hasty work a few years ago by leaning on the corner on the bump with the sander. You have to keep the sander moving somewhat in order for the sanded epoxy dust to fall away and allow the grit to make contact with the hard, non-moving surface. So, I do little circles on the runs being sure to used other parts of the sand paper on my palm sander. Also note – do not use any other type of sander other than an orbital design. If you use a belt sander you are going to end up in a whole world of hurt VERY quickly. 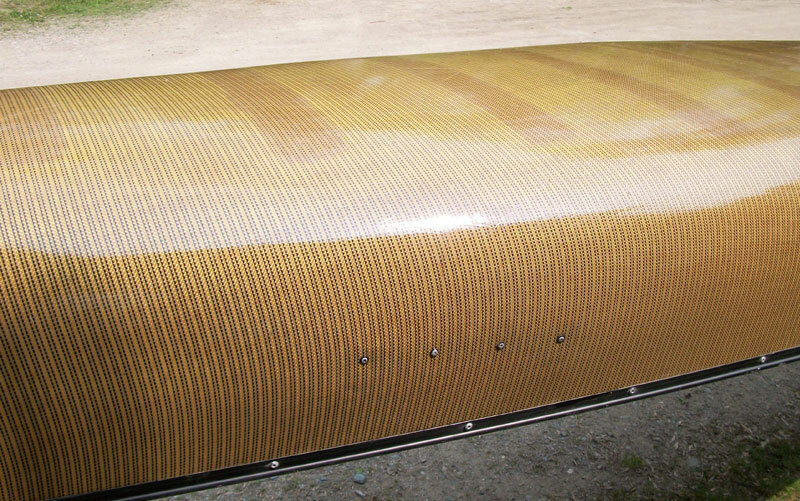 To sand a whole canoe takes about 30-45 minutes depending on your desired end result. Just get it reasonably smooth, take a “sander corner” pass over the length of the scratches and that’s it. I then found my favorite brush that served me for 20 years as an XC Ski wax brush, and swept off the canoe. I usually watch to see the way the wind is blowing and make sure I’m upwind so I don’t breath in the cloud of cured epoxy dust. continued up and down the canoe. 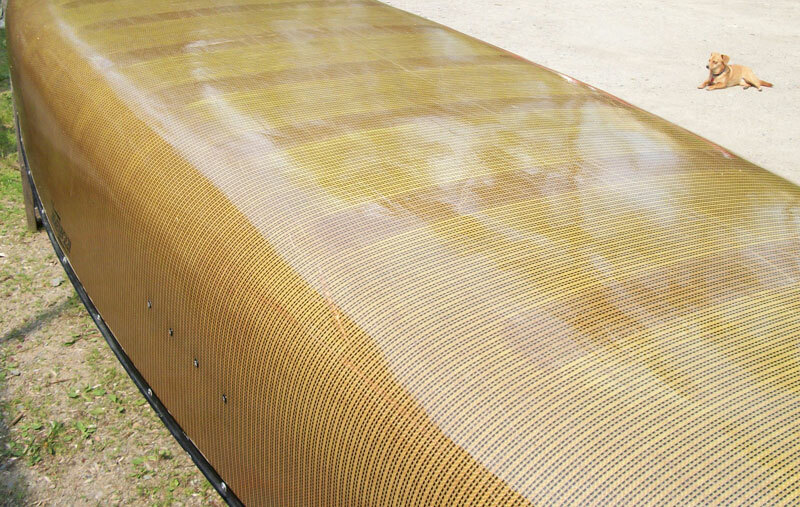 Applying resin to a dusty gray canoe makes it go to a pleasant brown with black stripes – or a typical Souris River Le Tigre Kevlar. 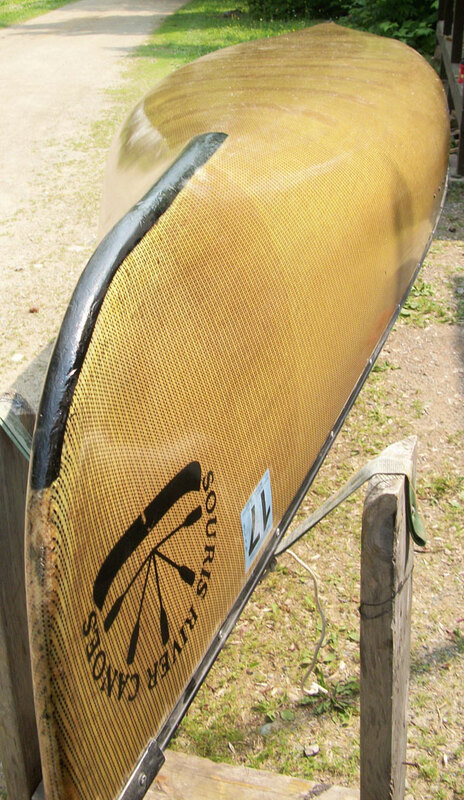 This improves the look of the canoe about 1000% and I would eestimate that about 90% of all lay canoe paddlers don’t even realize the canoe has even been refinished. Now, that may sound like a high number, but given my experience of the last 40 years of customers, I’ve decided that they are mostly incapable of noticing much at all. They don’t notice crooked woodwork, canoe straps flapping in the wind behind a car with a canoe on the roof turned sideways on to the road below, dangerous waters, or where to park their car based upon all the other “seed” cars in the extremely obvious and easy areas to park in the lot. This is a 2012 Le Tigre Kevlar Souris River in 2015. The grey parts are dust from hitting the ground. I got them out after the picture was taken. What they DO notice is only on a brand new, shiny, unscratched canoe. They go home and take a magnifying glass to the finish to look for the tiniest of imperfections (over every square inch) that don’t mean the most insignificant hill of beans to the operation of the canoe. They also notice the top handle of a canoe paddle as they over-analyze its feel and try to picture using it on the high seas while standing in the store. They also do notice when THEY are even slightly uncomfortable or getting rained on. They do notice hunger, sometimes thirst, and when someone else is annoying them but not the other way around. And that’s about it for 90% of the population of the world. And that’s a good thing. The main reason being as I was refinishing this canoe (it’s going back into rentals), I had pretty much the whole thing coated with fresh epoxy when it slid off of my horses – in slow motion (Ooooooohhhhhh-Noooooooooooooo! )- and landed upright in the gravel, sawdust, leaves, pine needles, dog fur, old bits of dusty of kevlar, and dandelion fluff. It was very special. I said some bad words. Actually, I repeated a choice four letter word loudly – and with relish. The whole event was like dropping freshly unrolled flypaper in sawdust. So, upon the universal battle cry of refinishing gone wrong, plus the big booming noise a canoe makes when it hits the ground, Jackie came running out and helped me get it back on the horses whereupon I proceeded to ruin a t-shirt with an epoxy/dirt blend. I then grabbed the roller, finished up the last few areas of that didn’t get covered pre-fall and I shot the pic’s of the finished canoe. For the occasional bits of debris stuck to it, I’ll just knock those off after it cures. I noticed that the digital pictures allowed me to see the dust that I missed when wiping off the canoe after the fall, so I went back and took care of that as well. I couldn’t see it with the bespectacled or even naked eye. So, my advice to canoe refinishers everywhere: Don’t drop it in the gravel.